Earlier this summer, I entered a giveaway over at Sandy A La Mode and actually *won*! The prize was store credit to Etty and Amelia, an Etsy shop filled with adorable hair accessories for all the girlies in your life. There happen to be a great many of those in mine, considering my three nieces plus our own future daughter, so I was a kid in a candy shop looking through her treasures! In the end, I chose the four at the top of the photo above. The purple is sized for newborn, the cream is sized for 3-6 months, the yellow is sized for 6-12 months, and the coral + sparklies is for little ol' me. How could I resist? Not long after these came in the mail, a lovely friend of mine (Mikalah of Posy the Porcelain Pig) stopped by to deliver a baby present. 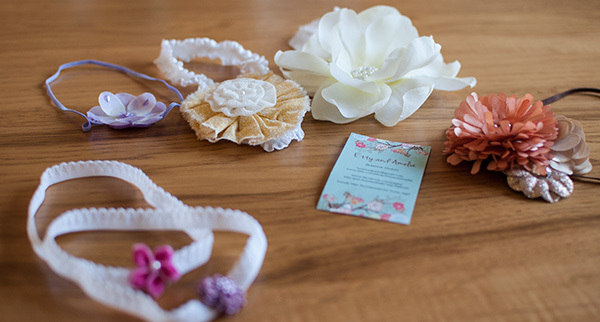 Since she's expecting her own bundle of girly joy any day now, she whipped up a couple headbands for ours! Those are the dainty flowered headbands at the bottom. The day of her arrival is coming soon - so while I'll still try to keep my post subject matter a little varied, you can expect at least some gratuitous baby photos featuring our daughter in these headbands. You've been warned. Ooh, I love the ones that you chose! That coral sparkly one is to die for. =) I can't wait to see the headbands on your sweet little girl!